Updated 9:30 p.m. Wednesday with corrections noted at the end of the story. The headlines invariably mention the band—“Stage Collapses Before Toronto Radiohead Concert,” reads The New York Times—which is no surprise, given that celebrity sells stories. Much less justifiable is that a mere fraction of the reports about the latest concert tragedy note that this is the third second major disaster of its kind in the last year at a show run by with a connection to Live Nation, the monopolistic concert giant whose record of emphasizing its profit margin over concerns for fans and artists has shifted from a matter of comfort, respect and aesthetics to one of safety. 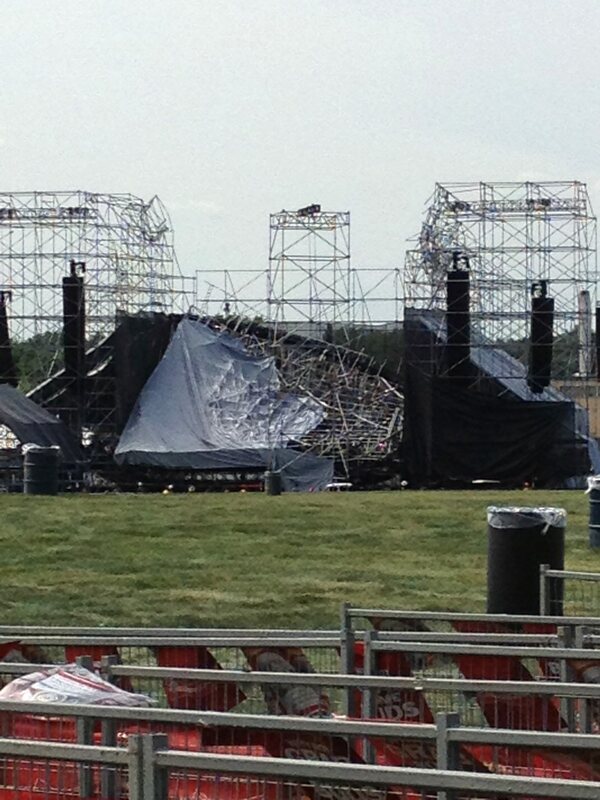 In 2009, one concertgoer was killed and 15 were critically injured when a powerful windstorm caused the main stage to collapse at the Big Valley Jamboree near Camrose, Canada. The promoter: Live Nation. Last August, shortly before a performance by Sugarland at the Indianapolis State Fair, a stage collapse killed seven people and injured 58 others. The show was set to go on despite three days of warnings about the possibility of violent weather. The promoter: Live Nation had sold sponsorships to the fair and was named in a civil lawsuit filed by the victims&apos; families, which was resolved in a $5 million settlement in December of 2011. What role Live Nation played in that collapse still is unclear. In contrast to that incident, the 40,000 people who were about to fill Toronto’s Downsview Park on Saturday to see Radiohead at yet another Live Nation show basked under clear, sunny skies with 75-degree temperatures and no wind. Nevertheless, an hour before the gates opened, as the most eager fans waited outside, the stage collapsed “like a pile of toothpicks,” according to one observer, killing the band’s drum technician Scott Johnson and injuring three other people. According to the CBC, the lighting crew had expressed concerns that the temporary structure was not strong enough to accommodate the band’s massive rig. Industry sources tell this reporter that Live Nation had intended to use a smaller stage because it was promoting two less sizable concerts in the same park after the Radiohead show, but the band insisted on a structure meeting its specifications, and the group was assured that its requirements had been met. The incident is being investigated by Ontario’s Labour Ministry, which officially is looking at all four of the companies involved: Live Nation, the promoter; Optex Staging, the contractor Live Nation hired to build the stage; Nasco Staffing Solutions, the technical and audio-visual contractor, and Ticker Tape Touring, Radiohead’s British corporation, which handles the group’s merchandise, tours, equipment, music distribution and publishing. But, the industry sources say, the primary focus of the Canadian probe is Live Nation. Live Nation has called the Downsview Park incident a “serious and tragic accident,” but the company declined comment on the Canadian probe. “This accident is being investigated but we do not have any further details at this time,” a spokeswoman said. Other than expressing the depth of its loss, the band also has mostly declined comment. Significantly, however, its publicist did tell the CBC that, “Radiohead installs its production into the performance space as provided by the venue and/or promoter”—that is, Live Nation. Though fans often hold the band accountable when anything goes wrong at a concert, anyone who follows the industry knows that the promoter really is responsible for everything that happens at the venue—all the more so when it’s a giant corporation like Live Nation, which often owns the facility and has a hand in everything from parking to concessions to ticket sales (since its U.S. government-approved mega-merger with the hated ticket seller Ticketmaster). To what degree, if any, is Radiohead culpable? At worst, the group made a decision that may have been good for business—with major headline acts, Live Nation often gives the band 100 percent of ticket sales, taking its profit from the sale of beer and hot dogs, parking and ticket “convenience charges”—but which did not show its usual concern for its loyal fan base. This critic and journalist’s heart sank when the group announced that it had signed with Live Nation for its summer tour and would be playing the First Midwest Bank Amphitheatre in Tinley Park as its Chicago stop. Formerly the World Music Theatre, the venue is notorious as one of the poorest-sounding sheds in the U.S. Patrons are fleeced with a steep per-person (as opposed to per-car) parking fee, even if they don’t drive or carpool, and despite the fact that the place is surrounded by empty dirt fields in the middle of nowhere. Add to that the steep concession prices, Live Nation’s obnoxious and ubiquitous marketing and a harsh and joyless ambience that screams “concentration camp” rather than “concert venue,” and you have an experience that is more about making money than enjoying music. However, aside from a handful of notable and failed crusades (remember Pearl Jam versus Ticketmaster in the ’90s? ), artists seem to have accepted Live Nation as the devil they have to deal with—even acts that are famous for caring for its fans and crusading for political causes, like Radiohead (with its support of Green Peace and quotes from Naomi Klein’s No Logo), Neil Young (the plight of farmers) and U2 (everything from feeding Africa to championing Aung Sun Suu Kyi). Unless superstars on that level begin demanding that Live Nation put fans first, it won’t happen—not with the pressure from Wall Street for the company to perform. According to the financial press, the mega-corp has lost money for the last three years, for a total of $611 million. And investors are beginning to voice their dissatisfaction with that and the sky-high compensation for its top executives. In a little-noted story that has an interesting connection to Chicago, shareholders recently showed a significant lack of confidence for the company’s board of directors. They were re-elected nonetheless, but the vote is usually just a formality, and this time, some of the directors garnered as many as 25 percent “no votes.” Among them: Ari Emanuel, head of Hollywood’s biggest talent agency, and the brother of our mayor. Correction: As originally posted earlier today, this story about Live Nation and the Toronto stage collapse contained two errors. The company was not the promoter of the Indiana Sugarland concert that claimed seven lives last summer; it sold sponsorships to the event and was named in the civil lawsuit filed by victims’ families along with the band’s ownership company, ESG Security, the stagehands’ union and other companies. Also, while Live Nation has a hand in this year’s Big Valley Jamboree at the Camrose Exhibition Centre in Canada, Panhandle Promotions, not Live Nation, was the promoter of the 2009 concert that claimed one life and injured 15 people. Nov. 2, 2010: Jam to Ticketmaster/Live Nation: Drop dead! Jan. 26, 2010: Looking closer at the Ticketmaster/Live Nation merger: What does it mean for Chicago?